Archive.org has a wonderful 90 minute English language conversation between two famous German rocket scientists! 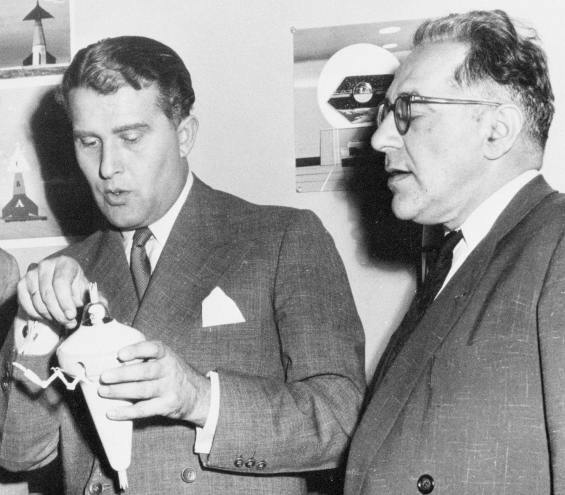 A historic conversation between German rocket scientists Wernher von Braun and Willy Ley. Highlights include the development of the German rocket programs during WWII, and the space program in the 1950’s. Recorded June 9th and 23rd, 1959, in New York City and Redstone Arsenal, Huntstville, Alabama. Indeed hearing Wernher von Braun and Willy Ley talk is very cool. old school days in Germany, Hermann Oberth‘s influential book Die Rakete zu den Planetenräumen (“By Rocket Into Interplanetary Space“), Fritz Lang movie Woman In The Moon, rocketry and rockets from the V-2 to the Saturn rocket family, geosynchronous satellites, the Mercury project, space stations, weather satellites, the Van Allen radiation belt, the role of humans in space, sending men around the Moon, the logistics of photographing and visiting Venus and Mars, space probes, a “semi-philosophical question about Man’s rights in space”, theological objections (and blessings), the compatibility between religion and science, Blaise Pascal, extraterrestrial life, vegetation on Mars, smart aliens, Arthur C. Clarke’s first law. As you can see it is very historic! I won’t say much more about the fascinating Wernher von Braun as I recently posted a biographical radio dramatization about him. But I will point out that Willy Ley is pretty damn amazing. Ley was an avid reader of Science Fiction, contributed science articles to Astounding Stories and Galaxy Magazine and was a member of the Trap Door Spiders – there is a wonderful Wikipedia entry about him to explore HERE. Ross Jenkins, Art Mueller, and Morrie Abrams are not your average high school students. While other kids are cruising around in their cars playing ball, this trio, known as the Galileo Club, is experimenting with rocket fuels and preparing for their future education at technical colleges. Robert Heinlein created something new when he started writing his “juvenile” SF novels. He wasn’t the first person to write what publishers would categorize as Young Adult SF but he was the first respected SF author to do so. Not only did it not harm his reputation, it actually enhanced it. Some of these, like Citizen of the Galaxy, The Star Beast, and The Rolling Stones still stand as some of his best books and are considered classics. His first juvenile, from 1947, was Rocketship Galileo. It’s a tale of three young fellows that have their own amateur rocketry club. When one of their rocket experiments go awry with an explosion, they find that one of the boys’ uncles was injured on the grounds. The injured man is Doctor Donald Morris Cargraves. He’s a scientist with his own background in atomic propulsion. With true do-it-yourself ethos, Cargraves recruits the boys to build their own rocket to the moon. There are incidents of sabotage, which creates the mystery of who is responsible for the sabotage. Eventually the boys with Cargraves in tow head to the moon. On occasion the story seems to stop for a science lesson. Once they reach the moon, they learn they are not alone. I’ll leave the nature of the co-habitants to the listener. I will say the answer that lies behind the sabotage attempts are less than satisfactory. What seems dated and implausible today was likely just as implausible in 1947 when the book was written. Although this novel is not the best of Heinlein’s juveniles, it is still an enjoyable ride with an optimistic future for mankind. The book is narrated by SF author Spider Robinson. 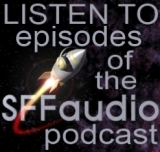 Spider is a gifted narrator with a flair for voice characterizations. His natural narrator’s voice seems a bit nasally at times, but he still conveys ease, and his pacing is unhurried. This is not the first paring of Robert Heinlein with Spider Robinson. Spider recently coauthored a book with Mr. Heinlein called Variable Star. Using notes and an unfinished outline, Spider Robinson was chosen by Heinlein’s estate to complete it. The story is said to be reminiscent of one of the master’s juvenile novels circa 1955. The good news doesn’t end there. Robinson was tapped by Blackstone Audio to narrate the audiobook for Variable Star, which has just been released.